Change is hard, because you are used to doing things the old way. Some of those old things are habits, you get up, stumble into the kitchen and put on coffee. After you are ready for work you read the news, play some Candy Crush and …oops, no time for cooking breakfast, got to just eat a couple of pop tarts (like I used to do). This isn’t what you want to do, it is what you are used to doing. Changing that pattern requires you to find something to make that doesn’t take as long as you think it does. For this to work, you have to be ready for it…get a dozen eggs at the store on your way home and a pint of heavy cream, make sure you can find your little omelet pan, find your cooked ham or Canadian bacon and put it where you can find it. My own egg frying pan is a little Calphalon non stick omelet pan. Yours can be anything from a nonstick skillet to a cast iron skillet, it has to be something the eggs wont stick to. In my kitchen eggs are the only reason I have a nonstick pan in the house. We always have cream in the house ever since we discovered that Coffee Mate has added sugar in it. I make my own Canadian Bacon (Peameal Bacon if you are Canadian) from a recipe I found in the book Charcuterie, which takes seven days to do. We have ham usually left over from ham dinners, and bacon is there if I have more time. Ok, here is a morning routine that works for me…post shower, stumble into the kitchen and put the coffee on, it takes four minutes with the Keurig machine. Put the Calphalon on the little burner and put the burner on ‘2’ so that the heat is very gentle. Get out 2 eggs, break them into a breakfast bowl, add two teaspoons of cream and whisk. Add salt and pepper, pour this mix into the skillet. Get out a small piece of Canadian bacon, cut it into thin slices (1/8 inch maybe) and then into 1/8 inch cubes. 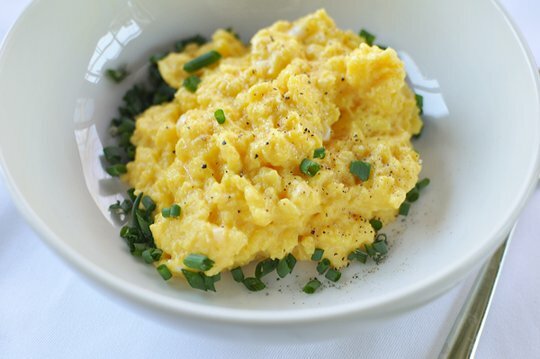 Put the ham in the eggs, and as soon as the eggs curdle a little bit, start the scrambling process by just digging them up and turning them over with your fork. Cook them slowly until they are almost firm. They keep cooking after you plate them and best a tiny bit under cooked than over cooked. Get your coffee, since it just now finished and eat breakfast. I literally never don’t have time to make that breakfast. Here is what breakfast looks like after a morning like that which I just described. To do the same thing using bacon requires you to cook the bacon first, and that may double the time that breakfast takes to make, but of course the kitchen will smell much better cooking that breakfast than the ham version…if you have the time, GO FOR IT. The point that I am making is that changing this one little thing makes an enormous difference in your life. The best way to change for the better is to change One Little Thing. If you normally skip breakfast, eat on the run from a fast food or coffee store, or eat processed ‘food’ out of a box, then this one little thing is enormous. Only quitting sweet drinks would make a bigger difference in your life than changing this. If you eat breakfast you will not be tempted by the pastry tray in the office, you will not be tempted by the candy machine at your first coffee break. Your body will not begin it’s day burning stores of energy from yesterday, but it will begin by warming up the machinery of digestion instead. For you that means that you will not commence the day from the short term starvation mode, where new energy is stored as fats first in your liver, you will be burning current food and any deficit will come from liver fat. This begins the daily process of reducing your weight in a slow, sustainable way, and the science (which I have terribly paraphrased and mangled) is well established and uncontroversial. By all means, incorporate breakfast into your life at your own speed, when you are ready. Nobody is forcing you to change for the better, but take my word for it, this change is so easy you will be astounded and puzzled that it took you so long to figure it out. It’s just that easy! This entry was posted in Uncategorized and tagged Breakfast recipe, Eating Right, health, It's That Easy, Nutrition, Skipping Breakfast. Bookmark the permalink. 1 Response to What’s Stopping You from Starting?